The Kidzy range includes structures aimed at children from 2 years onwards, and offers great value for money. It has a strong visual identity, inspired by the zen Japanese gardens and pagodas. The main play features are: the tunnel, climbing walls, walkways, climbing nets, and the sliding masts. 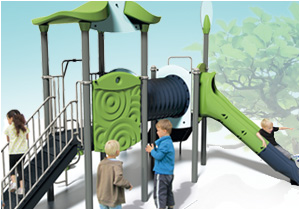 The combinations are installed using platforms with three different heights, starting at 97cm from ground level, and aimed at smaller children. The square and triangular shapes can cater for an optimized number of children. High side panels (from 1m to 1,30m) surround the platforms to ensure smaller children are well protected. They are available in three different models: tubular panels, openwork, or panels with embossed designs. The curved lines of the roofs, along with the totem masts creates the zen design the equipment was inspired by. The flexibility of Kidzy ensures it can adapt to any environment, budget or space. A simple approach was applied to this product range: from assembly of the structures, installation times, and choice of materials (compact, polyethylene and stainless steel) which guarantees durability and limited maintenance. This new range is fully inclusive. It has accessible steps, transfer platforms and large walkways.